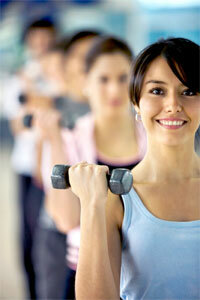 Regular exercise encourages bone growth and helps prevent osteoporosis, a bone-eroding condition. But some weight bearing and muscle strengthening exercises are especially recommended because they best promote bone growth. Weight-bearing exercise: These are exercises in which your body works against gravity, with your feet and legs bearing your body’s weight. people who have osteoporosis. Walking for about 1.5 km everyday is said to be the best weight bearing exercise because it minimises jarring to your bones. These are any exercises that strengthen muscles, like weight training or resistance training. They improve agility, strength and balance and even reduce the risk of falls and bone fractures. The force your muscles exert on the bones when they are exercised, also helps to strengthen them. The stronger a muscle is, the more force it exerts upon the bone. Even lifting a small amount of weight or using resistance bands on a regular basis can have health benefits and can help prevent a bone-eroding condition like osteoporosis. Calcium and magnesium are the two most important nutrients for good bone health. And the older you get the more important they become. When there isn’t enough calcium in the blood, it is leached from the bones, which decreases bone density. The recommended dietary allowance for men and women is at least 400 mg of magnesium and 800 mg of calcium a day. Vitamins A and D and Zinc are necessary for calcium metabolism. For Calcium: 1 glass of low fat milk, 1 bowl of cooked spinach, 100g of low fat paneer, 1 glass of carrot juice (about 6 carrots), 4 ragi chapatis and 100g of fresh coconut. For Magnesium: 20 blanched almonds, 1 glass of mint and coriander juice, 1 mango, cooked kabuli chana and 2 jowar chapatis. For Zinc:Whole grain products, seafood and animal meat. For Vitamin D: Egg yolk, organ meat, bone meal, and lots of sunlight. For Vitamin A: Best sources include fish liver oil, meat and animal products.